I’m melting here! Ok, this is the point where you can slap me, because I have to complain. Remember a few months ago when I was moaning and groaning because everyone was saying how warm it is, how hot it is, how your working on your garden, yadda yadda and I was sitting in cold, rainy weather? Well, it’s now hot here! Mid 90’s and I am dying. I haven’t exercised in forever, I can’t move! It’s to hot out! Ok, I’m ready for the slap!! I’m just never happy am I? However I did manage to walk to the Farmers Market today, because it’s food and heat won’t stop me!! I am excited to announce CHERRIES are back in season and I bought a pound of sweet cherries! he he!! But I have to tell you the lady at the FM told me that cherry crops didn’t do to well this year, so she doesn’t know if there will be any “pick your own”. I’m afraid that cherry prices may go up. I paid $4.99 a pound. That was worth it because there so perfectly delicious! So you must tell me, what should I make with them? Today’s recipe is so good and I am very proud to say I made this!! Ta da!!!! Pure spicy ketchup heaven!!! Let me give you a little back ground on why I made Jalapeno Ketchup. Saturday night I was sitting at the kitchen eating sweet potato fries and reading the ketchup bottle to my favorite Ketchup and the 2nd ingredient was pure cane sugar than glucose came in next. I thought why does their have to be sugar in it? Also the calories are 45 calories for one serving, which is one tablespoon. Do you know how many tablespoons I use? At least 4! So I took there other ingredients on the bottle and decided to make my own jalapeno ketchup. The ketchup came out perfect!!! Woohoo!!! The ketchup was so easy to make. It took about 20 minutes and you probably have most, if not all the ingredients in your pantry. Just like a fine wine, this ketchup only gets better with age. When I made it at first it had a slight kick. Once it sits overnight in the fridge, it really has some heat! I love it!! So if you want little heat, only use half a jalapeno, I used a whole one. If you want no heat, I’d omit the jalapeno all together. I was so excited to use it the next day, that I decided to make sweet potato fries again! Because in my opinion nothing goes better with ketchup than french fries! Wouldn’t you agree? 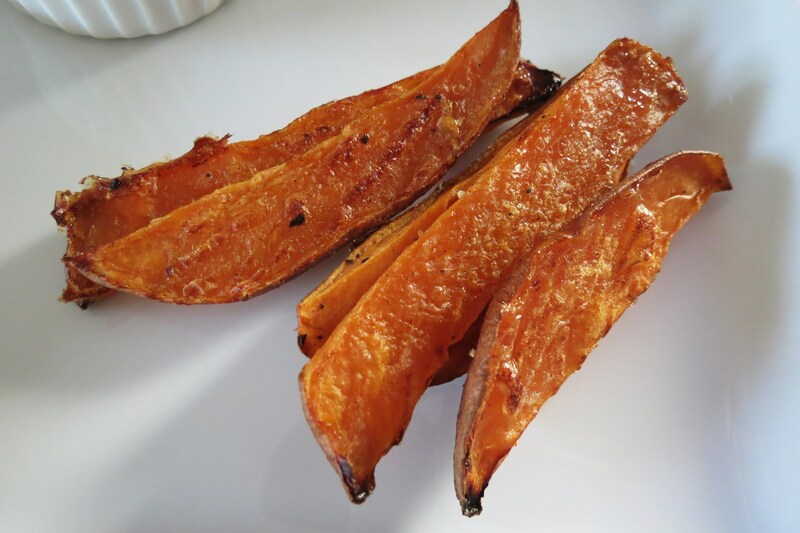 The Sweet Potato fries are a new recipe. I remember reading that you should cut your potatoes and place in a cold water for 30 minutes to get the starch out, so I decided to try that. Than I remember seeing on Food Network that they dipped the fry in a whipped egg white with seasonings, so I tried that and then I baked them. 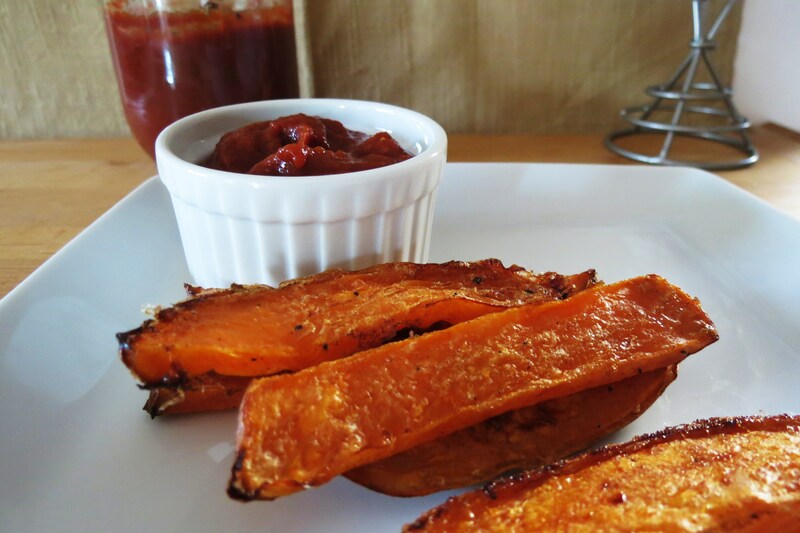 These are the best Crispy Sweet Potato Fries that I have had! Now there not crispy like a fried potato, but there as crispy as I can get a baked potato. There soft on the inside, but they do have the slightest crunch! The key is to whip egg white until your arm falls off. You want it to be foamy, than you pour it over the dried potatoes. Place on baking sheet and bake for about 35 minutes. If you try these, but be sure to watch them. Cooking time depends on how thick you cut them. 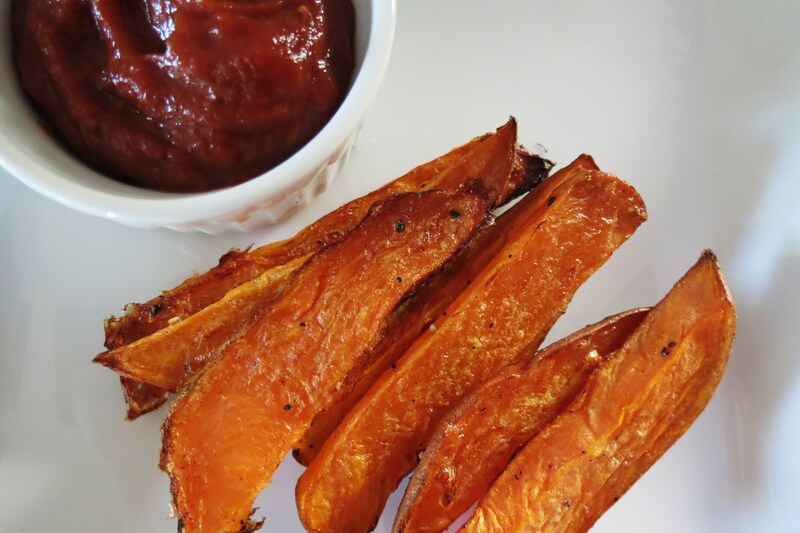 I will be honest, these are going to be the way I make homemade Sweet Potato Fries from now on! I swear if it wasn’t so hot out, I’d make some right now! The perfect match! Sigh… Ain’t food love grand? 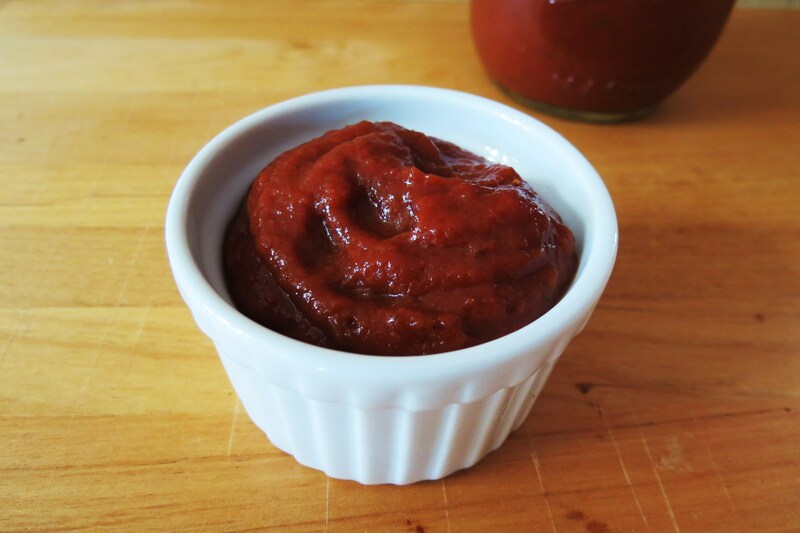 A spicy, thick, healthy sugar free ketchup with some heat. Add all the ingredients to a medium pot, on low heat, bring to a simmer, whisking together occasionally. Let it simmer for about 10 minutes. Once it cooled for a few minutes, place all ingredients in a blender and process until everything is pureed together. 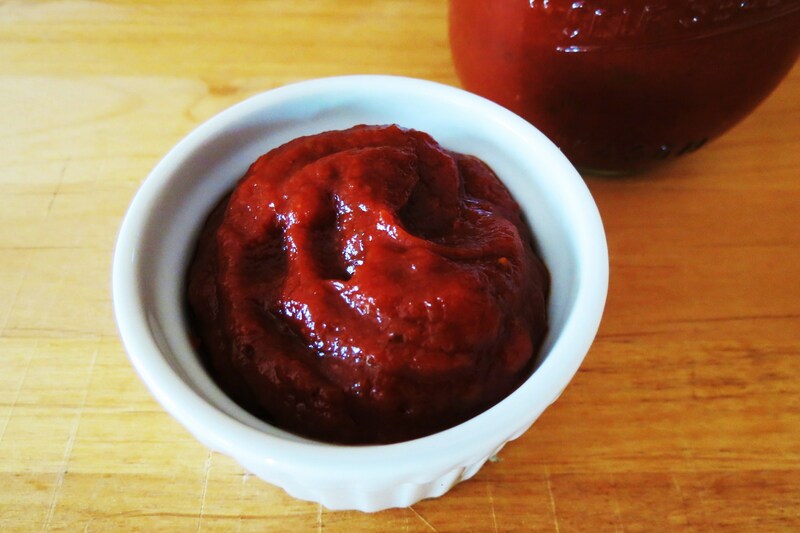 Place ketchup in a sealed container and once it's cooled down store in the refrigerator. Note: If you want regular ketchup, just omit the jalapeno. 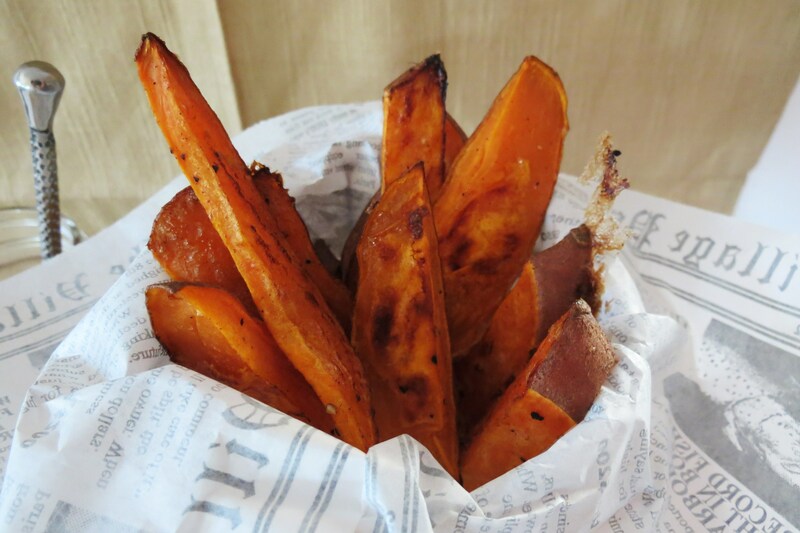 A crispy, healthy sweet potato fries that are baked and not fried! Scrub potatoes, pat dry, Cut into sticks. Place potatoes into a cold bowl of water and let them soak for 30 minutes to get the starch out. Line a baking sheet with parchment paper spray with cooking spray. In a medium mixing bowl, whisk the egg white until very light and foamy(a few minutes). Add the potatoes and the seasonings to the egg whites and toss to coat evenly. Spread the potatoes onto baking sheet, not touching. Bake for 30-40 minutes, or until golden brown and crispy; halfway through the cooking time, flip the potatoes and turn the baking sheet. Cook until crispy and serve immediately. I debated on whether I should share with you both recipes today, but I really thought if you make one, you should make the other. These two really do go together well. It’s sweet, savory and hot all in one!! Mmmm, dam I want some now. Maybe I’ll just spoon some ketchup? I also wanted to tell you as much as I love blogging, I may not post every single day, but I will try too. When I started blogging, I set a personal goal to post everyday for one year! I make weird goals. But this summer is going to be busy for me. I have a few trips for work this summer and I’ll be gone for a week on both of them, which will make it hard for me to get all my blogging in. I also want to enjoy the summer and not do an activity because I have to make a recipe or have to write a post. So I hope you understand, but really I am going to try to post everyday. I want to give you recipes I love and not so so one’s just to post a recipe. I believe in giving you quality recipe, even if you can’t tell from the pictures. The recipes I post are ones I love and make over. You may also notice that I plan on improving existing recipes or remaking them because I really took bad photos of them, and I believe they are so good that they shouldn’t get overlooked because I can’t take a picture. I have a few that I love but I had no clue in the beginning on how to photograph, I’m still learning. It’s harder than you think!! I have so many recipes I love that didn’t make it to you because the pictures look like crap! I hate that!! So I just wanted to give you a little inside on what I have in mind and what I plan on doing. Well my friends!! I chewed your ear long enough, so I am going to make something light for dinner, maybe a smoothie? 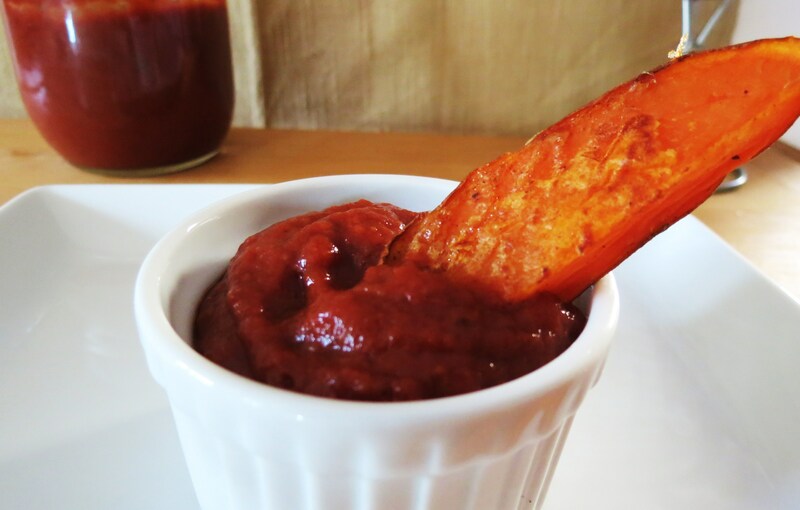 I am all about sweet potato fries and this ketchup sounds outstanding! Thanks! There probably one of my favorite snacky dishes!! I can’t get enough sweet potatoes! What a great idea to make fun ketchup! I’ve seen curry ketchup in stores, that would be good too. Ohh, curry ketchup would be good!! A fabulous combo, for sure! I will be picking up some sweet potatoes at the market this week! every bite for that price! lol. I just got a cherry pitter and I’m eager to try it out. I have a cherry pitter and I thought I wouldn’t use it, but it works and comes in handy! If I have an abundance of cherries, I pit them than freeze them. Your right, I should just savor them. Save the frozen ones for dessert. Watermelon is just starting to make an appearance. The pricing is $2.99 for a personal size one and $3.99 for a big one. I love watermelon! Now you have me craving it! I have been tempted to buy the sweet potato fries in the grocery store’s freezer section but they are never very healthy, because of one ingredient or another. I really appreciate this recipe, along with the prep tips (cold water soak, seasoned egg white dip, etc.). They will be an excellent weekend treat! Allen. P.S. – How could I forget to mention the killer Jalapeno Ketchup? omg that ketchup sounds awesome! 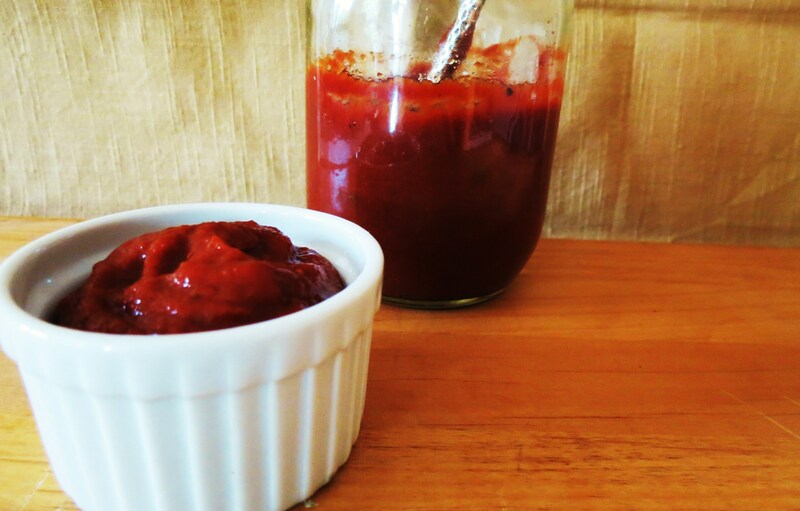 You made your own ketchup!?! So cool! I love this 🙂 PS: I am already complaining about the heat in Phoenix, and totally know I’ll complain about the cold in Ohio next winter too. I like 70-80 degrees…and moaning the rest of the time I guess! lol, I’m right with there. cant wait to read your posts about Ohio! I agree completely! I’m not much of a ketchup person, but I do love it on burgers and fries! At last I will now how to make chips properly, didnt realise that it is important to dry them. I have done so much research on making fries. I’ve been trying for a year! These are the best I could come up with and I’m pretty satisfies with them. I tried this potato recipe this evening and it was very delicious!! Thanks for sharing! Yah! Glad you like it! Did they turn out crispy? I was pretty happy with this recipe. It’s the closest I can get to crispy sweet potato fries without actually frying them.